Erebuni Medical Center is the largest scientific, educational and clinical multi-profile medical institution in Armenia, where are functioning 8 clinics and 45 departments. The Center employs more than 370 physicians, including 12 doctors of medical sciences, 60 candidates of medical science that provide not only clinical and teaching activities, but also lead the scientific and clinical trials studies. Many of them are principal investigators or performers in multicenter clinical research and trials. In purpose to insure the quality of clinical and experimental studies and public confidence that all ethical principles will be guaranteed and respected in any conducted clinical research at the Erebouni Medical Center in accordance with the international standards was created and now acting the Ethic Committee. 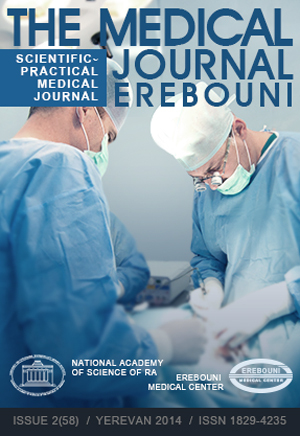 On this page you can find the publications of specialists of Erebouni Medical Center, as well as find a link to the electronic journal "Medical Journal of Erebouni", where you can review the publications of specialists not only from Armenia, but also from other countries. Here you can register as an author and submit your articles for publication in our Journal.